TweetWheel is one of the growing number of visual-based Twitter Apps that represents your Twitter Followers in a dynamic way. Imagine seeing your Twitterverse laid out in a colorful, interconnected web layout- that’s what you get with Tweet Wheel, one of the visual Twitter Apps. 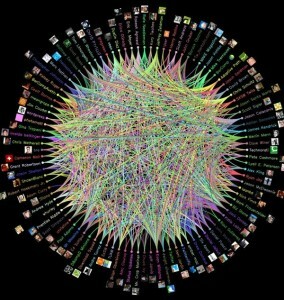 Contacts are connected by lines between your Followers and who you are Following. Scrolling over the various profiles that are represented on Tweet Wheel will give you more information about each of them. Understand that the more Followers you have the more time this will take to load. In the world of Twitter apps, Tweet Wheel does not offer increased usability on Twitter or anything in the way of managing your accounts. What it does offer is a visually stunning way to present your Twitterverse. The Tweet Wheel representation makes a great addition to your website or blog, offering a more compelling presentation than just saying, “I have X number of Followers.” Perfect for Powerpoint presentations or photo montages, Tweet Wheel allows you to show your Follower count without saying a word.